Your little finger may be small, but never underestimate the 'pinky'! pinky troubles & pinky hand gestures! Hand therapists say: the little finger accounts for 50% of your hand strength, but what else do we know about the 'pinky' or 'pinkie' finger? Scientific studies reveal that certain variations in the 5th finger may be related to autism & neuroticism. This article summarizes all major issues involved with pinkies. • What if you didn't have a pinky finger? 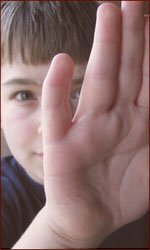 • 2009 Research: curved pinkies & autism! • 2015 Research: short pinkies & neuroticism! • Pinky troubles (non injuries): 5 phenomena! What if you didn't have a pinky finger? People may be inclined to consider the pinky merely as a decorative accessory of the hand. However, hand therapist have estimated that losing the little finger results in a loss of about 50 percent of hand strenght. Also, sometimes pinkies serve to be used for making hand gestures. And... the little finger is sometimes even featured with certain abnormalities that may provide a clue for the presence of certain problems in body and/or mind! The pinky, the humble fifth finger, the little finger that is used to crook daintily while sipping tea from a teacup. "You'd lose 50 percent of your hand strength, easily," says Laurie Rogers, an occupational therapist who is a certified hand therapist at National Rehabilitation Hospital in Washington. Rogers explains that while the index and middle fingers function, with the thumb, in pinching and grabbing, zipping zippers, and buttoning buttons - the pinkie teams up with the ring finger to provide hand power. A comparison with the other fingers can also be revealing. For example, compared with the other fingers the pinky doesn't carry the heavy burdens of the pointer, the index finger, which pokes things importantly and flicks through the Rolodex on urgent missions. The pinky usually also doesn't display your life's commitment with a belt of bright gold, as ring finger does. And the pinky doesn't, like the middle finger, succinctly communicate impudence or defiance. In 2009 research from The Netherlands was presented in the journal 'Molecular Psychiatry' describing a relationship between clinodactyly (curved pinky) and autisticl spectrum disorder [ASD]. "The presence of small physical defects and the occurrence of autism often go together", says researcher Ozgen et al of the UMC Utrecht [University Medical Center in Utrecht, The Netherlands]. This conclusion is the result of a meta-analysis of seven studies (published in: 1975-2005) in which the characteristics of 330 patients and 328 healthy controls are integrated. Ozgen became PhD on November 28 (2008), and the results were published in the journal 'Molecular Psychiatry' (in january 2011 updated results were published in the journal 'Journal of Autism and Developmental Disorders'). Clinodactyly: the curved 5th digit. • Eyes slightly further apart. These are subtle physical defects without medical meaning, and cosmetic surgery is usually not necessary. Ozgen noticed in her studies that these physical defects more often occure in patients with autistic disorders, compared to the healthy controls. It is important to notice here that the clinical relevance of the 'minor physical anomalies' (MPA's) for autism is still not described very well; the 8 studies included in Ozgen's data-pool included (only) 12 to 19 MPA's. NOTICE: Ozgen described that the occurrence of one or some of these abnormalities says nothing, but from an accumulation of 4 physical defects or more there appears to be a strong link with autism. No details appear to be available yet for the significance of certain combinations of MPA's. The presence of one single MPA should NOT be recognized as a 'significant' symptom of autism - because MPA's can sometimes also be found in persons who do not have autism!! But one might wonder: how surprizing is Ozygen's result on the 'curved' pinky finger in autism really? Maybe not so surprizing at all. For, in time a curved little finger has been related to up to over 60 medical syndromes, including: Klinefelter syndrome, FAS: fetal alcohol syndrome (16% to 51%), and most common: Down syndrome (35% to 79%). Nevertheless, one should also keep in mind here that 'curved pinkies' in general can be seen in the hands of normal & healthy people as well, statistics have been reported varying from: 1% to 19.5%. The percentages probably also vary with the treshold used by the research regarding the amount of curvation visible in the finger, etc. Autism is frequently featured with a 'low 2D:4D digit ratio' [= the ratio between the full length of the index finger (= 2th finger) & the full length of the ring finger (= 4th finger)]. How to measure the 'digit ratio' of a hand? • STEP 3: calculate the 'digit ratio' as the quotient of: 2D/4D. 5th digit dermatoglyphics & Autism! Another interesting link between the little finger & autism has been presented a few years earlier by the author of the present article (van Mensvoort, 2000-2003): THE HAND & AUTISM. • Palmar zone: extra triradius d' + accessory loop; fused triradus; palmar dermatoglyphics below the 5th digit(*). Palmar dermatoglyphics below the 5th digit. * The results indicate that for example an additional loop- or whorl located proximal to the palmar d-triradius (which is found in the palm below the little finger), does not appear to be rare in the hands of people who have ASD. This characteristic is present in 3 out of 38 ASD hands (= 7.9%) vs. only 1 in 400 hands (= 0,25%) in the control population. NOTICE: More details about this dermatoglyphics research are presented in the article: THE HAND & AUTISM - including various references to other scientific studies which have related autism with fingerprints & palmar dermatoglyphics. Recently, a study from The Netherlands has pointed out that the overall development of the pinky finger (combined with other hand factors) may provide a significant clue for the Big Five personality dimension Neuroticism. In general, the results indicate that short pinkies appear more common in high scorers for Neuroticism (= emotional instability); while long pinkies appear more common in low scorers for Neuroticism (= emotional stability). Hand chart: 12 hand signs in Emotional Stability & Neuroticism! NOTICE: Very short pinkies represent also a common trait in Down syndrome, where the length of the pinky is often even shorter than half of the palm length! Phantom picture charts for the hands in emotional stability & neuroticism; meanwhile, phantom picture charts for the hand in the all other Big Five personality dimensions are available HERE. Camptodactyly involves a flexion deformity at the proximal interphalangeal joint; the term 'camptodactyly' origins from the Greek "bent finger". For the pinky finger one could therefore speak of a 'bent pinky finger' or 'crooked pinky finger'. However, be aware: the next pinky trouble variation can actually be described with the use of similar language. Clinodactyly involves bending- or curvation of the finger in the plane of the palm. The term 'clinodactyly' origins from the Greek terms: kliner, "to bend," & dactylos, "a finger". Therefore this condition can also be described to represent a 'bent little finger'. Polydactyly involves extra fingers. Extra fingers can be associated with various conditions such as: Holt-Oram syndrome, fetal alcohol syndrome, Patau syndrome & Rubinstein-Taybi syndrome. This phenomenon is a.k.a. 'webbed fingers' - which occures in about 2000 to 3000 live births. Syndactyly usually involves a fusion of the 3th & 4th finger (the long finger and the ring finger); only in very small percentage of syndactyly the fusion concerns the little finger as well: see TYPE III & TYPE IV in the picture below]. Usually the 4 four fingers have each 2 horizontal creases, which are related to the interdigital zone of the finger bones. However, in some people a finger has only one single interdigital crease. For healthy persons this hand feature is extremely rare. However, Rodewald & Wischerat (1979) have described that the 'single interdigit 5th finger crease' is a very common hand feature in: Down syndrome [trisomie 21] (26%), Edward syndrome [trisomie 18] (63% to 79%), Patau syndrome [trisomie 13] (5%), and only sometimes in other medical disorders. These so-called 'trisomy' syndromes also exhibit a significant relationship between the prevalance of: a (fused) single crease on the pinky finger & a (fused) simian line in the palm! In Australia the RTA launched a "little pinkie"-campaign including women crooking their little fingers at young men in fast cars: the 'little pinkie' hand gesture infers the men have small penises. Nevertheless, it appears that so far a small manhood has never been correlated with a little pinky finger / small little finger. Made using a combination of the letters 'I', 'L', and 'Y' from American Sign Language. It is made by extending the thumb, index finger, and little finger while the middle and ring finger touch the palm. Be aware: this hand gesture is also the symbol used to curse someone in Italian culture! In the United States college sports this hand gestures is associated with fans of the Texas Longhorns. Also, former US president George W. Bush (who lives in Texas) has frequently used the 'Hook 'm horns' hand gesture. In this perspective the 'horns' are related to the horns of a bull (sometimes described as Sign of the Horned God). Be aware: in some other countries (Italy, Spain, Portugal & Brazil) this hand gesture may have the meaning of a sexual insult! The Shaka sign - or: "hang loose" / "chilax" hand gesture - is a common greeting gesture, often seen in the beach and surfer culture. The pinky swear ritual (a.k.a. to make a pinky promise) is the touching of the pinkies of two people to signify that a promise has been made. NOTE: The name 'Littlefinger', refers to a fictional character created by American author George R. R. Martin for the series Game of Thrones. • 12 Fingers and 13 toes: a world record! • Never underestimate your little finger: the pinky!